Communicating ideas, shaping both athlete & brand images, while building & protecting reputations have been at the heart of Mike Mooney’s efforts for more than two decades in the motorsports arena. He has launched & led high profile sponsorships for companies such as Sprint, Walmart, Johnson & Johnson & Mercedes-Benz. Mooney saw a trend in the early-2000s between how reputations were being managed & the impact of an instantaneously connected global community via Social Media. He also saw a consistent disconnect between two key elements that drive strong reputations – values & behavior. His experiences led him to write Reputation Shift – 5 High-Performance Truths to Win in the Reputation Economy, a values-based approach to harnessing the power of reputations for leaders, entrepreneurs & anyone looking to succeed, not only in business, but life. 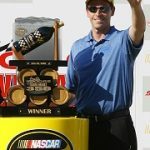 Mooney is currently Senior Vice President of Business Operations for Roush Fenway Racing, one of NASCAR’s premier racing organizations.